There is no age limit for braces. As long as you have good periodontal health, braces can be used to straighten your teeth and correct your bite. More people over age 30 are getting braces today than ever before. Most ArchWired.com readers are between the ages of 25 to 55! However, if you have been on a Bisphosphonate drug for osteoporosis (such as Fosamax or Boniva) you need to talk to your orthodontist or dentist first. Read this article to find out why this is very important. I wore my retainer for a while when I was younger, but then I stopped wearing it and my teeth shifted years later. Is this common? Yes, it is more common than you think. The teeth are actually more dynamic than you'd expect. Sometimes, when wisdom teeth erupt, your bite can change in adulthood. A large percentage of adults in braces are in them for a second time! My kids just got braces and now I'm thinking of getting them, too. Many adults "finally get their teeth done" when their kids go in for orthodontic treatment. It's more common than you think! Several ArchWired.com readers have an entire family in braces! What is it like to have braces put on your teeth? Does it hurt? Getting braces put on your teeth does not hurt, and does not require Novocain injections or anything painful. For a full description of the process, read Braces Basics: When the Braces Go On. The average cost for a full set of braces in a typical two-year treatment is about $5,000 US. The cost varies depending on where you live. Major metropolitan areas tend to be slightly higher in cost than rural areas. Generally, metal braces cost less than ceramic ones. Invisalign treatment can be just as costly as traditional braces, and sometimes is even slightly more expensive. Many people in the U.S. have dental insurance through their employers or as individuals/families. This insurance usually cover orthodontic treatment for children up to age 18, but does not cover adult orthodontics -- or only covers it up to a certain dollar amount. If your plan covers adult braces, consider yourself in the lucky minority. I can't speak for dental plans offered overseas, as I know very little about them, and some are government-run (such as the NHS in the United Kingdom). Remember, most insurance plans and discount dental plans do not cover treatment that is already in progress. So, if you are going to sign up for a dental plan or insurance plan, do it before any treatment begins. Also, beware of any waiting periods your dental plan may enforce. And by the way, jaw surgery or extraction is sometimes covered under your medical insurance, so be sure to look into this, too. How can I find an orthodontist or a discount dental plan? To help find an orthodontist near you, it's best to get personal recommendations. Ask friends who have braces (or whose kids have braces). If your insurance covers orthodontics, see if it is limited to specific dentists/orthodontists. Or, post a query on ArchWired's Metal Mouth Message Board; our readers are all over the US and around the world, and are very helpful! Dental plans come and go; some are better than others. Please read the fine print carefully before you sign up for anything and check with the Better Business Bureau. If you don't have dental insurance, you can sign up for a discount dental plan. A discount dental plan is not insurance -- it is a cooperative of dental professionals who have contracted with a company to offer their services at a discounted rate. Many are available, offered by different companies. You can search for discount dental plans on Google or DentalPlans.com. Or, ask a trusted insurance agent or your own dentist. I can't afford dental insurance or a dental plan. What can I do? If you don't have dental insurance and can't afford a a discount dental plan, there is still an alternative. If there is a dental school in your area, call them and ask if they have a clinic. Often orthodontists and dentists in training will practice on patients in the school clinic, under the watchful eye of experienced teachers who are themselves dentists and orthodontists. This service is offered to the public at a minimal cost. Can I get those invisible braces (Invisalign) instead of traditional ones? That depends on your specific case. Invisalign braces are usually not recommended for very complicated cases, or cases that involve extractions. Only a qualified dental professional who has examined your mouth can decide whether Invisalign is right for you. If you are very concerned about your appearance with braces, another thing to consider is lingual braces, which are behind the teeth (such as iBraces). An orthodontist must take special training to do lingual braces -- not every orthodontist does them. "It takes many years to become an orthodontist. As in medicine, the educational requirements are demanding. Only dentists who have successfully completed this advanced specialty education may call themselves orthodontists." Should I get braces done by a dentist or by an orthodontist? My personal opinion leans toward orthodontists. Some dentists incorporate orthodontics into their practices. They have probably completed some extra coursework in tooth movement management and facial development. Some dentists who practice orthodontics have completed more coursework than others. Don't feel shy about asking a dentist about his orthodontic qualifications -- what extra training he has completed, and how many orthodontic patients he has seen. Just because a dentist says he or she "can do braces for you" doesn't mean that they have all the training necessary to successfully handle complicated treatments. Some dentists confer with their their orthodontic colleagues to ensure that they're doing things optimally. If you have minor orthodontic problems, your dentist might be able to handle your case. Complicated cases are probably best handled by an orthodontist who has more training. If you're considering getting braces, you should probably get at least one opinion from an orthodontist to ensure that you are getting the correct type of treatment. How many orthodontic consultations should I get? You can get as many orthodontic consultations as you want. In a consultation, an orthodontist looks at the alignment of your teeth and your facial aesthetics and gives you a general opinion of what he or she would do to correct your problems. Usually the consultations are free or of minimal cost. While an orthodontist can look at your teeth and give you a general opinion, he or she can't put together a comprehensive treatment plan for you until teeth molds and panoramic x-rays have been done. There is usually no one right way to correct orthodontic problems -- there are many ways, and different orthodontists may give you different opinions. That is why it's a good idea to consult with two or three orthodontist before you start treatment, especially if they recommend extractions, headgear, or jaw surgery. What are some of the risks of getting braces as an adult? Root resorption - The structure of the tooth's root may break down, causing its destruction. Gum recession - The loss of gum tissue around the tooth, which in severe cases can expose the tooth's root. The "triangle" of gum tissue surrounding some teeth may also recede. Allergic reactions - If you are already allergic to nickel or latex, tell your orthodontist. There are alternative brackets and bands which are nickel and latex free. You may be sensitive to these substances and not realize it until you get braces. If you develop unusual swelling or tenderness in your gums during your treatment, or any sort of hives or rash on your face and mouth, allergy may be the culprit. What is a "bite" and what is malocclusion? Occlusion is another word for your bite -- how the teeth in your top and bottom jaw meet with each other. Mal comes from the Latin root meaning "bad." So, a malocclusion means a bad bite -- a bite with problems. It means that your top teeth do not line up properly with your bottom teeth. 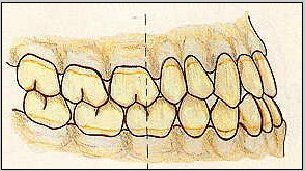 What are the "classes" of malocclusion? Class II malocclusion occurs when the bottom jaw is in a more posterior (backward) position than normal. The top teeth appear to protrude out over the lower teeth. One example of this type of malocclusion is often referred to as "buck" teeth. 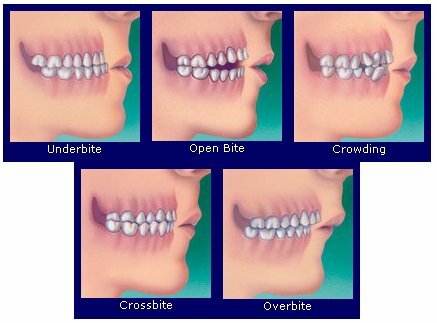 What are the "types of bite" and what do they mean? Overbite. Patients with overbites appear "bucktoothed" and have a receding chin. The lower front teeth are positioned too far behind the upper front teeth. This condition can result from a horizontal overdevelopment of the upper jaw or an underdevelopment of the lower jaw or a combination of both. Underbite. Patients with underbites have a strong jaw with a chin that juts straight out. The lower front teeth are positioned in front of the upper front teeth. This condition is caused by the horizontal underdevelopment of the upper jaw, the horizontal overdevelopment of the lower jaw, or most frequently a combination of both. Crossbite. This occurs when the upper teeth are biting inside the lower teeth. This is frequently the result of a narrow upper jaw. Crossbites also occur because of a mismatch in jaw size and position between the upper and lower jaw. Some crossbites also lead to asymmetry of the lower jaw by causing the jaw to be abnormally deflected to one side when closing the teeth together. Proper diagnosis determines how and when a crossbite needs correction. Open bite. This occurs when the upper front teeth cannot meet or overlap the lower front teeth even though the back teeth have closed together. Sometimes this this makes eating difficult. Open bites are caused by the overdevelopment of the back portion of the upper jaw in a vertical direction. As the back portion of the upper jaw grows vertically downward, the lower jaw will open in a clockwise direction. This explains why open bite patients have a long facial appearance. When will I begin to see changes in my teeth after the braces are put on? According to a recent ArchWired.com poll, most people begin see changes in their teeth in the first 2 to 6 weeks of treatment. Are people going to think I look geeky or weird with braces on my teeth? Of course you're self-conscious because it is YOUR mouth, but frankly most people don't give a hoot. Your braces are a conversation piece for about 3 minutes; after that, nobody pays much attention. Really. And most people don't think you look geeky. In fact, they probably think you look cute, or applaud that you are doing something positive to improve your appearance and your dental health. Whenever you become self-conscious about your braces, think about how great you'll look after they come off! What if I move away and change orthodontists or dentists once my orthodontic treatment has begun? What happens? Changing orthodontists mid-treatment can be tricky. Most orthodontists work on a "pay as you go" plan. In other words, you pay a certain amount of money at the outset of treatment (for the molds, consultations, and having the braces installed). Then, each month, you pay a percentage of the rest of your balance. So, if you move away from your orthodontist, be sure to tell him/her ASAP so that you will not be charged extra. You orthodontist will probably "pro-rate" your balance or refund some of your money. You should also request your dental records, or ask your orthodontist to forward them to your new doc. However, you may wind up paying a few hundred dollars more to your new orthodontist. After all, this new doc has never seen you before, and you are a new patient to him. Hopefully, changing orthodontists mid-treatment won't raise your costs too much. In any event, this is a good argument for NOT PAYING THE ENTIRE BALANCE UP FRONT. Personally, I think that paying it all up-front is a really bad idea, even if it saves you money. For example, there was a story in the news a few years ago about an unscrupulous dentist who took full payment from his patients -- and then closed his practice! Some of them had to pay the full amount (in excess of $5,000) again to the new orthodontist, and some just couldn't afford the unexpected expense and had to stop their treatment. The odds are that your dentist would not do this to you -- but even under the best circumstances, nobody knows what the future holds, so I think that "pay as you go" is safest option. For more details on this subject, read Braces and Moving. Should I get teeth extracted as part of my orthodontic treatment? But once we are adults, dentists are limited to what is already in place. If your orthodontist recommends extraction, it may be wise to get at least one more (if not two more) opinions before going through with the procedure -- once the teeth are gone, they're gone! Your teeth and jaw help to shape your face. Changing the underlying structure will result in some changes in your facial appearance. You should discuss this with your orthodontist. There are newer types of bracket systems that apply lighter forces and may be able to correct your problems without extractions, such as Damon Brackets. You may want to ask your orthodontist about it. Sometimes however, depending on your unique case, extraction may be the only way to successfully straighten your teeth and correct your bite. For more information about extractions, see Getting Teeth Extracted for Braces. Yes, you do, to some extent. At first your teeth will hurt and you won't be able to bite into hard foods, big sandwiches, or anything too chewy or crunchy. It is best to stick to soft foods until your teeth begin to feel better -- usually in a few weeks. Read Soft Food Suggestions to help you cope.